Though we make this Paanakam for Srirama Navami or on Fridays, this is a great drink for summer. In south India this is given as an after food during Sumangali Prarthani along with Neer More and Sukku Vellam. 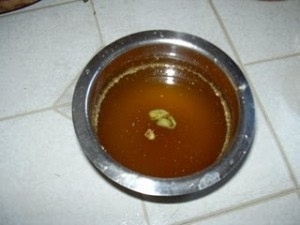 Heat jaggery with 2 cups of water to dissolve. Strain, boil to honey consistency. Add all powders, cool & add lime juice. Refrigerate. Dilute to required consistency, adding plain or ice water whenever required. Add Pepper powder if and only if there is a slight cold and cough. Better to avoid it, if one need to relish and enjoy the taste of Panakam.